The childproof door locks prevent the rear doors from being opened from the inside regardless of the position of the lock tab. 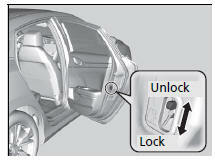 Slide the lever in the rear door to the lock position, and close the door. Open the door using the outside door handle. To open the door from the inside when the childproof door lock is on, put the lock tab in the unlock position, lower the rear window, put your hand out of the window, and pull the outside door handle.